Siberia is a heavily Russified area – linguistically and culturally – of the Russian Federation. Not only do many ethnic Russians live there, but most members of the indigenous groups speak Russian, at varying degrees of fluency. Many indigenes, moreover, have abandoned their native languages altogether for Russian. But how did Siberia become so heavily russified? Perhaps surprisingly, the dominance of Russian in Siberia is a relatively new phenomenon. The Russians started their expansion into Siberia in the late-16th century, and by 1639 they had already reached the Pacific, founding the city of Okhotsk in 1647. 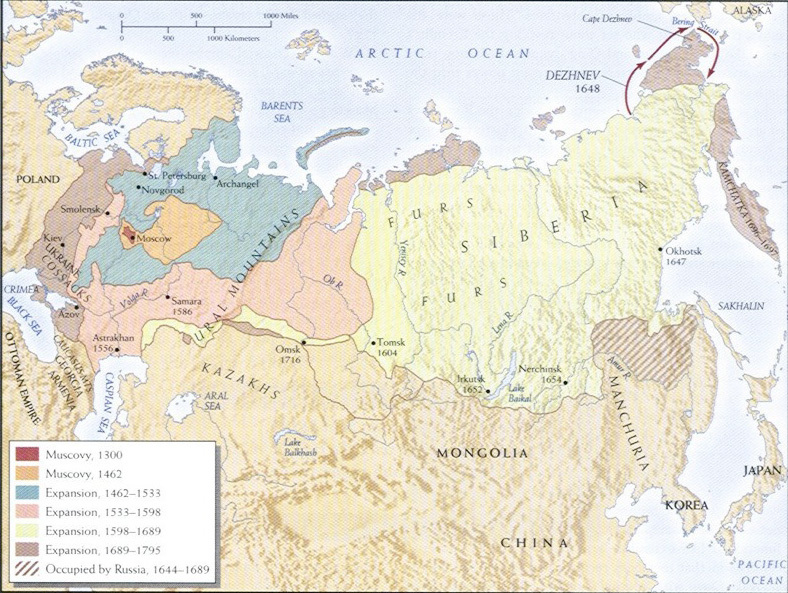 While some areas of the Far Northeast were not colonized until much later, the vast bulk of Siberia was firmly under Russian imperial rule by 1700. 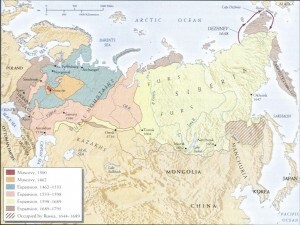 Yet the spread of the Russian language into Siberia in the Tsarist period was limited. 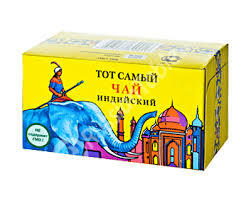 The driving force of imperial expansion consisted of units of Cossacks, a large but ethnically mixed group of militarized peasants who had taken up the nomadic ways of the steppe peoples. 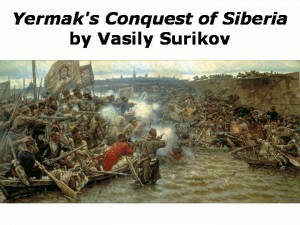 Even though the term is Turkic in origin, the Cossacks mostly spoke Russian. In Siberia they were followed by small numbers of soldiers, missionaries, tax-collectors, peasants looking for freedom and land, and political exiles banished by the government. The number of ethnic Russians settling in Siberia was relatively small through the first two centuries of Russian rule, and their linguistic impact long remained thin. Not until the mid-1800s did significant numbers of Russian peasants move into Siberia, and even then they remained highly concentrated in the southern, and especially the southwestern, portions of the vast region. As elsewhere in the growing Russian Empire, “four major institutions … had been crucial to the spread of Russian beyond its homeland in north-eastern Europe. They were the Orthodox Church, the army, the state bureaucracy and the educated elite, usually known in Russian as the intelligentsiya” (Nicholas Ostler, Empires of the Word, pp. 437-438). But the russifying efforts of each of these institutions were undermined by various factors. The Orthodox Church, for example, used Old Church Slavonic rather than Russian as its liturgical language. Old Church Slavonic is related to Russian, but it is neither a literary form of the language, nor an older, ancestral variant of Russian, but rather a separate extinct Slavic language. Curiously, the Tsarist state long opposed translating the Bible into Russian; as result, the Bible was actually available in several other languages of the Empire before it was published in Russian. By a curious twist of fate, “publication of the Russian Bible could not be authorised until 1876, by chance just after the first Russian edition of Karl Marx’s Das Kapital” (Ostler, p. 438). The army helped spread the use of Russian within the Empire, but to a limited extent. The state stressed the Russian nature of its military forces, contrasting it with the Austrians army’s ragbag of races and languages. However, the military’s broader russification efforts were hampered by the fact that most soldiers were recruited from the core area of Russia, Belarus, and Ukraine; in general, Muslims and other non-Russian indigenous peoples were exempt from military service. According to Ostler, such ethnic restrictions diminished the power of the military to effectively russify the vast country: “if more non-Russians had been obliged to join up, more of them would have had to learn Russian” (Ostler, p. 439). Furthermore, many army veterans, released after serving for twenty-five years or more, ended up in towns as coachmen, domestic servants, or schoolteachers. As a result, they were less able to seed their language across the imperial expanse than their counterparts in other empires, most notably that of Rome. The influence of the bureaucracy in spreading the Russian language was also less than what might have been expected. For one thing, the bureaucratic ranks were filled disproportionately by German speakers from the Baltic states, up to 20% in the eighteenth and nineteenth centuries. In Siberia, the bureaucrats, such as there were, had a restricted scope of activities, focusing mainly on gathering the poll tax, known as the yasak, and on the recruitment of troops. Their social interactions with other groups were very limited. Finally, there was the intelligentsia, writers and thinkers who, regardless of their philosophies, were very Western in their cultural orientation. Many of them spoke French alongside – and often more fluently than – Russian. Most of the members of this small class were disconnected from the vast majority of the population, speaking a different language and following different, more Europeanized cultural norms. The disconnection of the intelligentsia from the Russian masses was furthered by their heavy reliance on written discourse, as most Russian remained illiterate. As late as the early 1880s, and only about 10% of the population were able to read. In short, although Russia, had long been politically and militarily unified, it did not actually form a linguistic community during the Tsarist period. Imperial Russia, like most empires, was a highly polyglot state dominated by one enthnolinguistic group. But this was to change rapidly after the 1917 Russian Revolution, although in a rather ironic manner. While the strategy of the Tsars to the very end was to strengthen the Russian state and to keep it under Russian supremacy, the Soviets’ official policy in the early years was almost the opposite. At least in theory, all peoples of the Soviet Union were to be considered equal; as a result, no uniform official language was instituted at the time. Party congresses in March 1921 and April 1923 formulated a doctrine of “indigenization” (in Russian korenizatsiia) which consisted of two parts: the creation of national elites and the promotion of local national languages to a dominant position in the non-Russian territories. All indigenous groups had the right to use their languages not only at home but also in education. Still, the state continued to be highly centralized, and Russian effectively remained the language of inter-group communication throughout the Soviet Union. 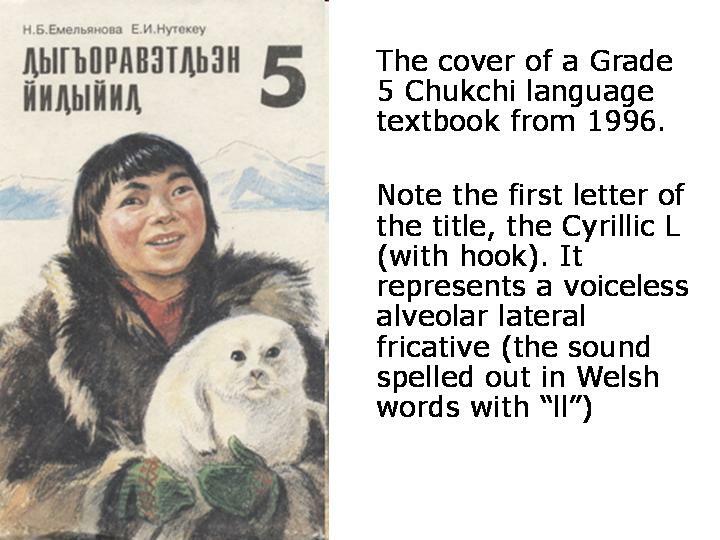 One immediate practical change, and challenge, during the early Soviet period was the development of literacy. According to the last pre-revolutionary census of 1897, only 28.4% of those aged 9-49 were literate, yet by the last pre-war census of 1939, this number had increased to 87.4%, and in 1959 it reached 98.5%. 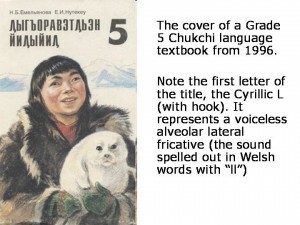 These figures include literacy in languages other than Russian, a necessary precondition for which was the provision of effective writing systems for the Soviet Union’s indigenous languages. 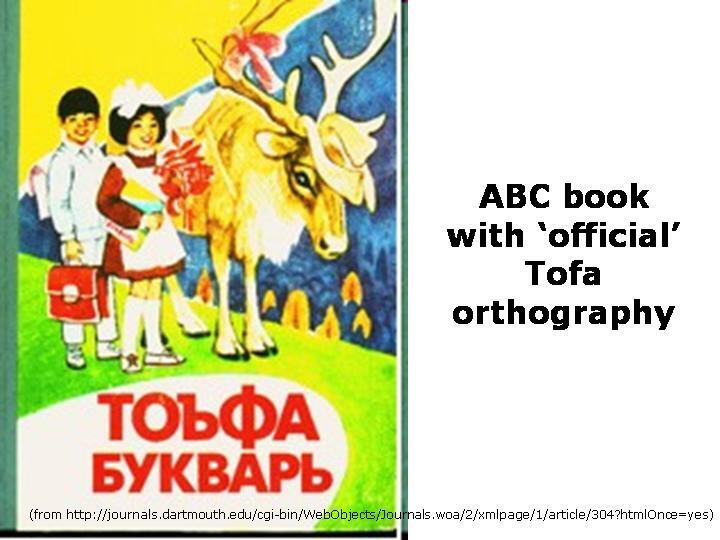 Prior to the Bolshevik Revolution, most native languages had no writing system; after the revolution alphabets were developed for over half of them. In the 1920s most indigenous orthographies were based on the Roman script, since it had been most thoroughly developed by phoneticians. The process of adjusting the Roman alphabet to serve the needs of multiple local languages was painstaking, to say the least. Many Soviet linguists were employed in the task, devoting much time and effort in fixing standard forms among dialects, and in balancing considerations of majority usage with mutual intelligibility and ease of acquisition. By and large, the results were remarkable, and as a result, many new “literary languages” emerged during this period. 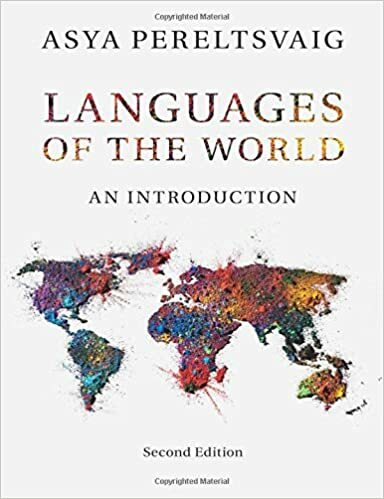 Many languages, such as Nanay, Nivkh, Koryak, Chukchi, Khanty, and Mansi, which received writing systems during the 1920s and 1930s, have retained these systems, in modified form, to the present day (Bernard Comrie, The Languages of the Soviet Union, pp. 23-24). Universal education heavily promoted Russian, a compulsory subject in all schools. Indigenous languages – where taught at all – were available as a school subject for speakers of that language, but not as a medium of instruction. 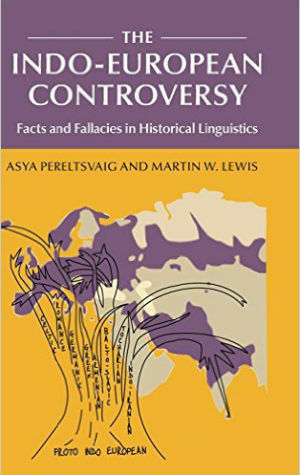 Furthermore, ethnic Russians virtually never studied the local languages, with the result that bilingualism among them was extremely low, only about 3% by the early 1980s (Comrie, p. 28). Massive population movements, starting in the 1930s and continuing throughout the Soviet era, greatly contributed to the spread of Russian, even where it had equal legal status with a local language. As a result, by the 1960s, most Siberian indigenes spoke some Russian. Today, groups that claim knowledge of Russian, at varying degrees of fluency, include the Kereks and Chulyms. * Near universal knowledge of Russian (99%+) is found among numerous Siberian groups, including the Aleut, Itelmen, Kamchadal, Ket, Mansi, Nanay, Negidal, Nivkh, Orochi, Teleut, Tofalar, Tubalar, Udege, Orok (Ulta), Ulchi, Chuvan, and Shor. The least russified groups include the Tuvinians-todzhins (a small subgroups of Tuvans), yet 80% of them claim knowledge of Russian, and the Telengits, whose corresponding figure is 84.6%. This spread of the knowledge of Russian corresponds to a change in its legal status: during the whole Soviet period, Russian was never made into the sole official language of either the USSR as a whole, or of the Russian Soviet Federative Socialist Republic. The first Soviet Constitution of 1924 prescribed the use of six languages for “the decrees and decisions of the CEC [Central Executive Committee], of its Presidium, and the CPC [Council of People’s Commissars] of the USSR” (as well as for the phrase “Proletarians of all countries, unite!” on the Soviet insignia): Russian, Ukrainian, Belarusian, Georgian, Armenian, Turko-Tatarian (Articles 34 and 70). Even the last Soviet Constitution, adopted in 1977, by which time the russification of indigenous Siberian peoples was all but complete, still stated that “exercise of [the equal rights of citizens of the USSR] is ensured by a policy of all-round development and drawing together of all the nations and nationalities of the USSR, by educating citizens in the spirit of Soviet patriotism and socialist internationalism, and by the possibility to use their native language and the languages of other peoples in the USSR” (Article 36). Yet the post-Soviet constitution of the Russian Federation specifies that “the Russian language shall be a state language on the whole territory of the Russian Federation” (Article 68), though internal republics such as the republics of Altai, Buryatia, Sakha (Yakutia), Tuva, and Khakassia, “have the right to establish their own state languages” (federal subjects other than republics have no constitutional rights for an official language determination). *There are only eight ethnic Kereks left, according to the 2002 census. They live in the Far Northeast and have been thoroughly assimilated to the Chukchis, so that they now speak Chukchi in addition to Russian. Chulyms are a Turkic people in the Tomsk Oblast and Krasnoyarsk Krai. 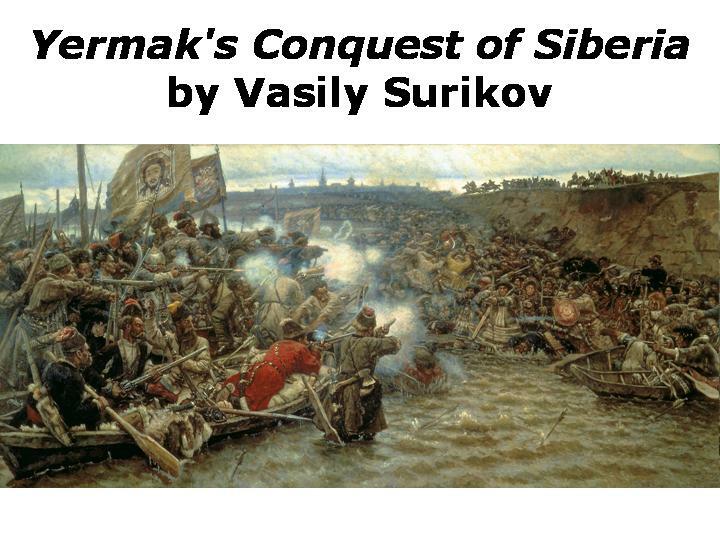 They were driven from their homes in the Sibir Khanate by the forces of Ermak Timofeevich in the early days of the Russian expansion into Siberia. (Serbo-)Croatian: A Tale of Two Languages—Or Three? Or Four?